I feel like we’re at an inflection point. The car companies have announced $300 billion that they’re investing in making EVs. There are going to be 160 new models over the next few years. This is going from crazy boutiques mall to mainstream and consumers are going to love it. Everybody I know that’s driven an EV loves driving it. I think what the car companies and we in the industry have in mind is the cost has to be competitive, the range has to be strong, and there has to be charging infrastructure everywhere. When Tesla made their third-quarter targets every car company in the world and every boardroom said, oh my goodness. I think they need to be worried about everybody. What we see here in the United States is so much progress. General Motors is great. Nissan has been around for a long time also. GM and Nissan now have over 200-mile cars that are affordable. That is obviously really big. Ford had historically been a bit of a laggard and now Ford is leaning forward on making an electric F-150. I don’t think that there’s a car company that’s serious in the world that’s not investing seriously in electrification. We are just a few years from mainstream adoption of electric cars and fully relying on charging stations. We’ve already got a million EVs on the road in the United States. We suspect that there is going to be probably six or seven million in the five years or so, which is which is a lot. Bloomberg New Energy Finance says that it’s going to be fully ten percent of sales in 2025. With an inflection point on the S-curve and we’re going to be looking at 30-40 percent of sales in 2030. 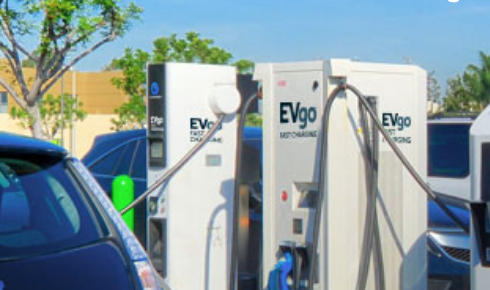 What EVgo does is fast charging. What we’re seeing is that most people who bought an EV charged at home. But what we’re now seeing is people who live in apartments need to charge away from home quickly. The most interesting new bit is with the rise of the rideshare ride-hailing economy, where like my kids who are millennials don’t want cars, but they do ride-sharing all the time. The drivers of those cars like for Lyft and Uber, they need to drive, they need to charge quickly, and they need to charge away from home, and they charge a lot. Electric trucks are starting to hit the scene now. I would say that light-duty vehicles, regular cars, are a couple years ahead of the trucks. But I just came from the Bloomberg conference and there were a number of truck companies that said, we placed an order for a thousand, we placed an order for a few hundred. So the experiments are beginning. Within a few years, you’re going to see truck fleets. All fleets are going to be relying increasingly on electrification. Fascinatingly, the Chinese are moving really quickly and the difference in the policy settings are what might make China move even faster. Some say that right now it’s even money that we could win or China could win. If the Chinese government puts policies in place to accelerate the market then fully there are some people who would expect that 70 percent of EV sales in China’s, a very big economy, are going to be EV by 2030. Nobody thinks that the US market will move quite that fast. It has to do with creating policy reasons for manufacturing to go ahead fast. With the market growing so quickly the market for non-luxury vehicles (over the next few years) is going to have a lot of market entrants. So I think that Tesla’s going to have to compete with that. They’re going to have to compete on cost. They’ve got beautiful vehicles. But look at the vehicles that Hyundai and Kia and Nissan and GM are bringing to market, they’re going to compete with Tesla. It’s going to be great.